We turn up the volume to find the best bluetooth headset on a budget. As more phones and other devices decide to ditch the headphone jack, you may find yourself scouring Amazon for a new set of Bluetooth headphones. Sure, a pair of $400 Bowers & Wilkins P7s will do the job just fine, but what about those of us with a budget closer to $30? Can you find a quality pair at that price point? Are there noticeable differences in the headphones at that price? Will these budget Bluetooth headphones sound as sweet as they look? We spent over two hours working out and listening to various types of music with each of these eight devices to find out. Disclaimer: We purchased these earbuds at our own expense, and prices listed in this article are accurate at the time of publishing. Highs: SoundPEATS is a popular brand with regular deals on Slickdeals for their QY7 device. The "bat wing" look of the QY7 ear pieces may seem strange but these rubber ear inserts are rather comfortable. Sound quality is strong and this Q7 headset delivers an extremely clean bass note when compared to the other headphones we tested. Lows: While in motion, the SoundPEATS Q7 controls can be difficult to feel for and are less user-friendly than some of the competition. The Q7 had the worst real-world Bluetooth connection range of any of the headsets in this price range and could be an issue when wandering only a room away from your device. Highs: The Otium headphones in the red color may be the best-looking set of budget headphones that we have tested. The construction is a matte plastic and would be confused for a more premium Bluetooth headset by anyone taking a passing glance. The device has a higher IPX-6 rating to allow for brief water fights or extreme perspiration while you are out running. Lows: The design secures the "ear hooks" over the top of your ears but the fit is slightly loose and the earpieces can shift while running. While the construction and controls are stellar, the sound quality is lacking at times. Sound quality is average at lower volumes for both highs and lows but can become rather flat when the volume is higher, which is often the case while running outside. Highs: The Mpow headset features a textured plastic that gives the look of aluminum and is one of the lighter sets that we tested. The earpieces fit tight and you can nearly forget you are wearing anything while working out. Getting connected is easy and the Bluetooth distance is among the best of the bunch. The Mpow brand is no stranger to Slickdeals and discounts can regularly be found in the forums. Lows: The controls for your music are easily accessed on the headphone cord and include the standard multi-use and volume buttons. The sound quality favored bass-heavy songs and was rather flat on music lacking any bass. Tight earpieces can become slightly painful after extended use, despite trying several different sizes. Highs: The contoured rubber cord helps keep the HB06 on your ears while running and the three pairs of included ear tips are comfortable. The audio quality tends to highlight the highs in your music but has a good balance overall and is surprising for the price. Lows: At $14.99, this is one of the most affordable sets and it shows when handling the headset. The HiGoing HB06 has a very conspicuous design that lets everyone else know you are wearing a pair of Bluetooth headphones. While the HiGoing headset will stay on your head through a workout, it is just loose enough to have you wondering the entire time how it is staying on your head. Highs: Despite the alien-looking design, these are the most comfortable pair of over-the-ear headphones of the group. The New Trent earbuds lay secure enough on your ears to avoid movement without any of the strain from the other designs. Control buttons are easy to access and the device jumps into pairing when first powered on. Lows: The price is one of the more expensive at $25.99, but deals are often available. The sound quality on songs with heavy-bass is rather poor and well below the less-expensive options on this list. Highs: Most dynamic range for sound and both highs and lows are nearly perfect. Easily the best sound quality of any of the headphones we tested. Included ear tips help comfortably position buds in your ears and there are no concerns of the headphones falling out. Anker is one of the most popular budget brands and deals abound in the forum. Lows: It may seem basic, but the faint "R" and "L" engraving on earbuds can make it difficult to determine which ear each earbud goes into. The Anker SoundBuds can take more time than most to find the right sizing to make sure earbuds are comfortable. Highs: Easier controls than every other Bluetooth unit with six buttons overall. Internal vibration for notifications is a nice feature and magnetic earbuds attach to the collar to help stay out of the way. Lows: The collar design can be rather cumbersome and an annoyance while running compared to lighter headphone sets like the Anker system. The Rienar system lacks heavy bass but the sound quality is generally clean otherwise. Plastic construction is rather poor and the components look cheap and feel brittle. Highs: Lightweight and soft rubber materials help the LanBaiLan fit comfortably with its over-the-ear design. Bluetooth range is very good and it even has the ability to connect to multiple devices. Lows: The headphones sound overpowered on any song with a fair amount of bass. The headpiece can become rather slippery with any sweat and can shift and feel like they are falling off while working out. Overall, the group of Bluetooth headphones we tested performed better than expected for the price. There are some sacrifices in audio quality at this price range but a majority of casual users who simply want to workout while listening to music will have no problem finding something under $30. 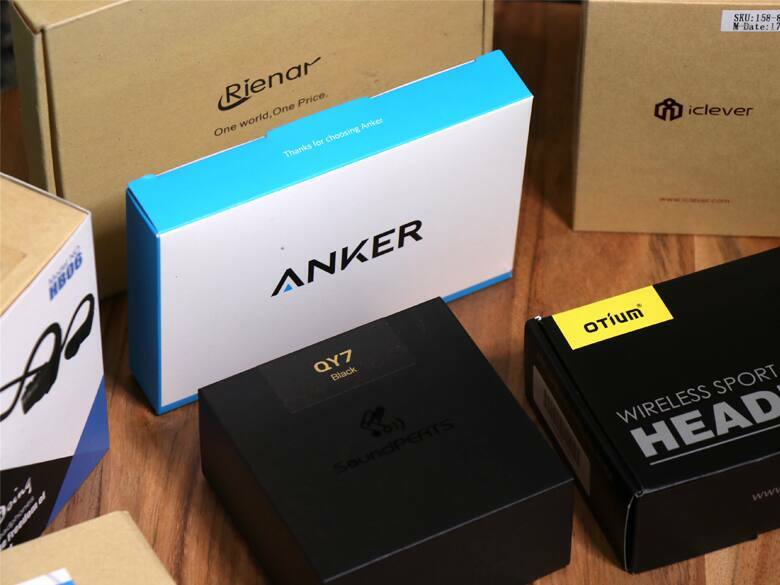 Out of this group, we would recommend the Anker SoundBuds Slim Wireless Headphones. The sound quality and construction of this device is noticeably better than the other Bluetooth headphones by a considerable margin. Anker is a popular brand on Slickdeals and it's certainly worth setting a deal alert for if you are ready to ditch the headphone jack and go wireless.